Tusheti is a small region of Georgia but very special and unique area of Eastern Europe. 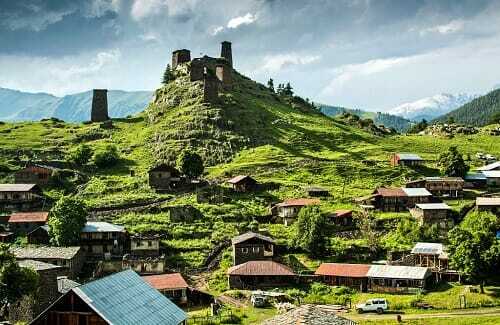 It’s located in the heart of high mountains of Caucasus. There are many villages and most of them are remain abandoned from that time on and just only few villages in Chagma community are still populated: Omalo, Shenako and Diklo. Please contact us and we will calculate prices for you, as it’s hard to have fixed prices for hiking tours. In this 1 day tour you have a possibility to see: Shatili (UNESCO World heritage site with 60 towers), Mutso (Medieval village) Abudelauri lakes (three lakes: green, blue and white), Roshka and the most beautiful untouched nature in Caucasus mountains of Georgia. ▶ Hiking accessories like: Tent, sleeping bag, etc. ▶ Tour destinations and hiking distance can be reduced. ▶ Accommodation can be provided in guesthouses/hostels or in tents (campsite). ▶ Horses can be used to ride some distances if you wish.